I am not a fan of muffins. I have purchased muffins from Starbucks, Coffee Bean and even Delifrance but nothing was up my alley. Before we continue with these Soft Blueberry Cream Cheese Muffins, let‘s talk about one of my favorite shows on Netflix. Zumbo just desserts. I am obsessed with that show! I have encored it four times and was praying in my heart hoping that they come up with a season 2. Yesterday while I was gawking at food pictures on Instagram, I came across Adriano Zumbo post, and he said Season 2 of Just Desserts is coming up soon. I am literally over the moon. So freaking excited! Anyways, back to these babies. 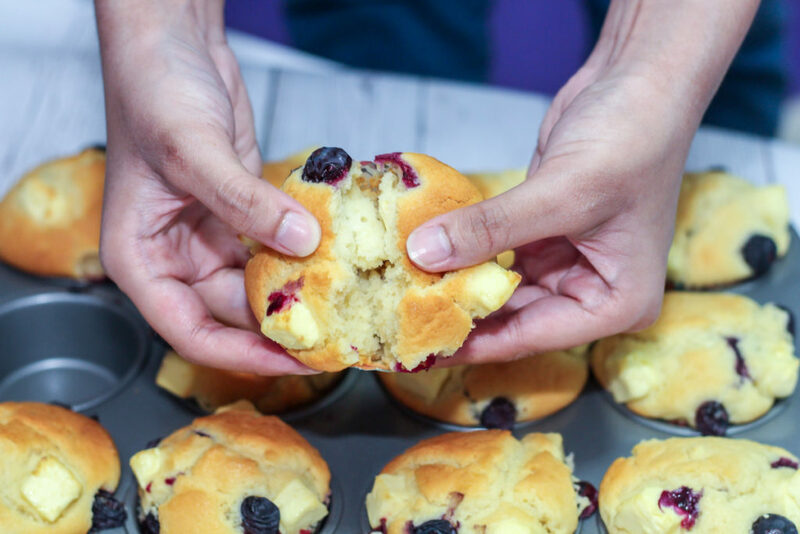 I personally prefer my cakes soft and rich wherelse muffins are not as soft as I would like it to be and it’s also not really rich so I was convinced that Muffins are not supposed to be delicious until I tried this recipe. These are definitely the softest muffins I ever had. So what made these muffins soft? It is the yogurt. 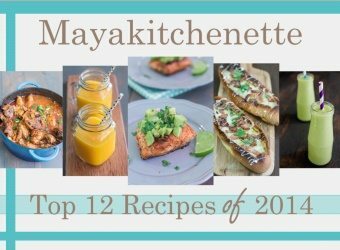 There is always something about yogurt/sourcream/buttermilk/vinegar that makes your bakes softer. I guess it is the acid. 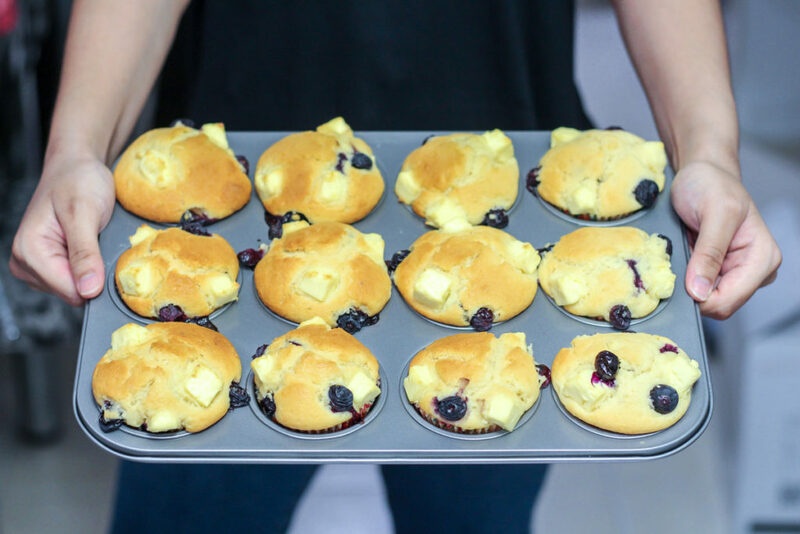 I made these with the niece and the only reason why I wanted to prepare it is because of the chunks of cream cheese in the muffins and the good thing is since the niece is over, I can always bake, take 2 muffins and pack the rest for her to take home. That is my strategy for damage control. If you also feel that a muffin’s place is next to a cup of tea/coffee, just like a biscotti cause it needs to get dunked and soften up, these muffins would change your perception. 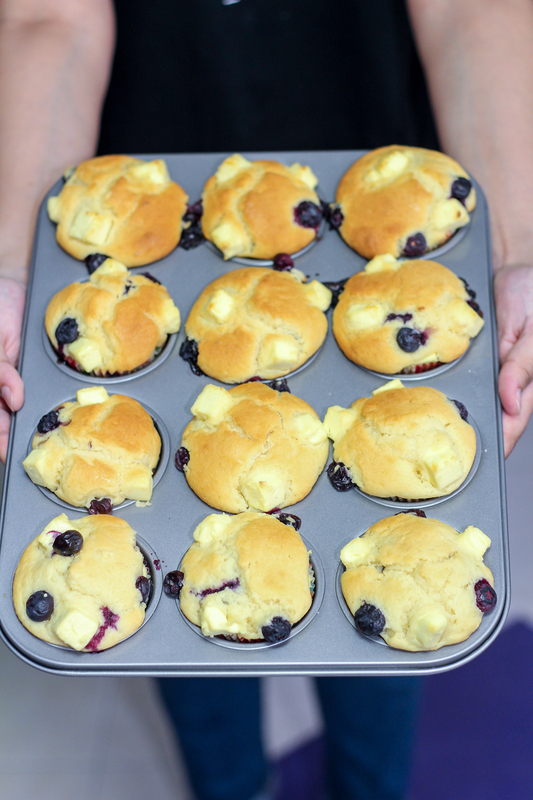 As I said, these muffins are way softer than a regular one. The cream cheese is cut into cubes and then placed in the center of the muffins and on top too. We are not talking about 3 cubes of cheese okay? Make it 8 cubes please. That’s what will make these muffins good. Darn the cream cheese for being so good. Why can’t cream cheese be some kinda power food that you can consume daily? 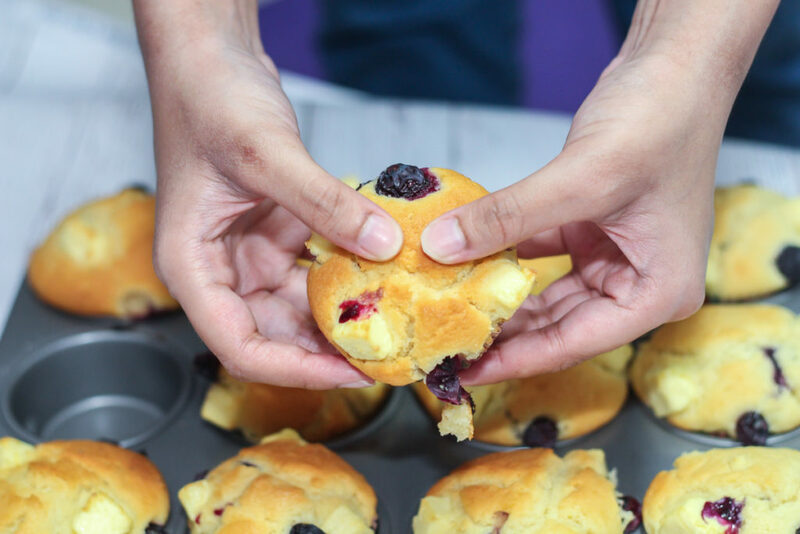 Most of the time, we are told to fill the muffin only 2/3rd of the way. Let’s say for this one, we wanna fill it all the way. It’s go big or go home. Oh, and please eat 1 muffin while it is still hot, when the cream cheese is still creaaaamy and fluffy and tender and perfect and okay you got what I meant. 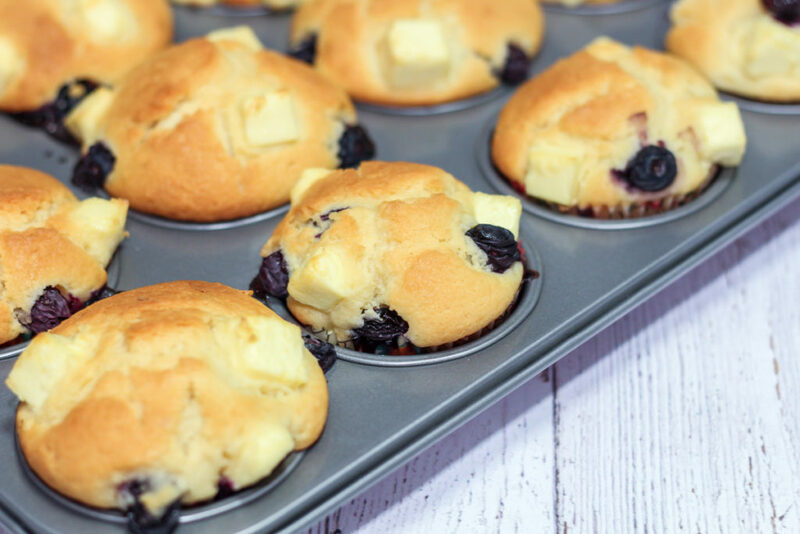 Line muffin pans with paper baking cups. In a bowl, mix yogurt and cream and set aside. Using a mixer, cream butter and sugar till white and creamy. Add eggs, 1 at a time. Add ⅓ of the flour and mix well. Mix in ½ of the yogurt + cream mixture. Repeat with remaining flour and yogurt + cream mixture. Fold in vanilla and blueberries. 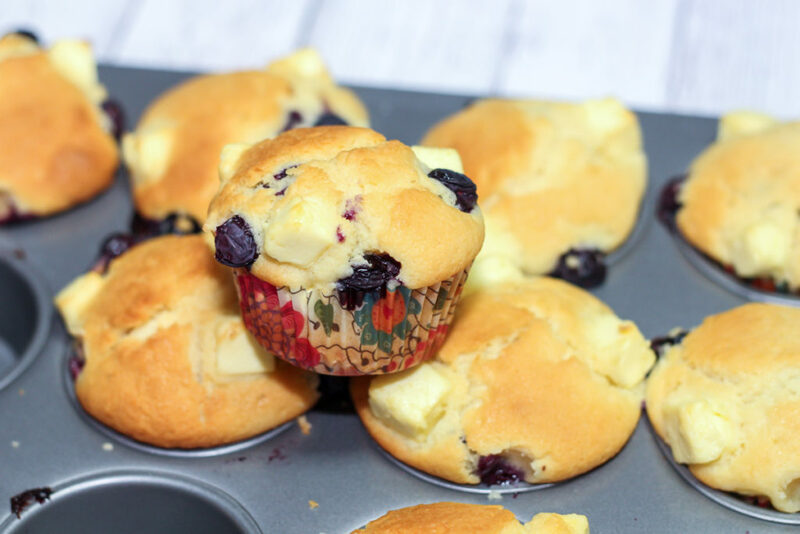 Fill muffin cups with about 1 tablespoon of batter. Top with 4 cubes of cream cheese. Top with another tablespoon on batter and finish it off with another 4 cubes of cream cheese. Bake for 15-22 minutes until a toothpick comes out clean from the center of a muffin. Cool 5 minutes in pan then remove to a rack to cool completely.